Choosing the proper location should top your priority list while planning to purchase a property, whether for personal use or as an investment. You must buy property that faces lesser impact of an earthquake. Apart from the property location, you must be well aware of the building structure; how strong is the high-rise establishment, whether it is designed to survive a seismic turmoil or not, up to what intensity etc. The main factors that determine the seismic risk of any particular area are: the degree of seismic hazard, the amount of property and the number of people exposed to the danger and how vulnerable they are to a potential earthquake risk. 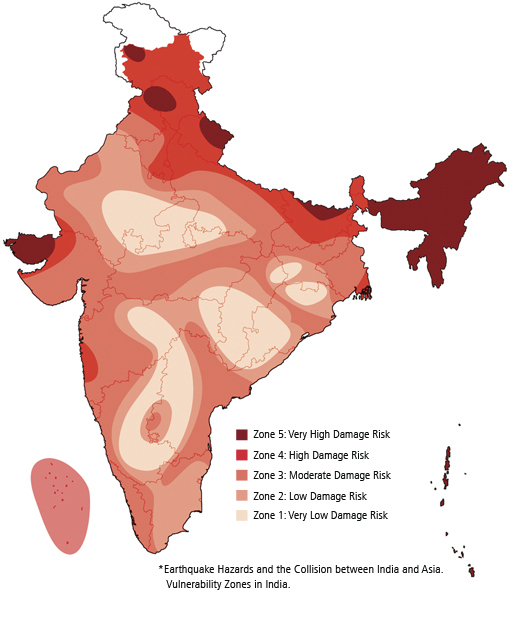 Hazard: The seismic risk zones notably vary across the Indian sub-continent. As per the earthquake resistant design code of India [IS 1893 (Part 1) 2002], the latest edition of seismic zoning map has assigned four levels of seismicity for India. According to the zoning map, zone 2 is associated with the lowest level of seismicity whereas zone 5 is indicative of the highest risk of earthquake. Zone 2 This zone is classified as the Low Damage Risk Zone. Zone 3 Some parts ofÂ Bengal, the Patan area in Maharashtra include in this zone. Zone 4 The Indo-Gangetic basin, Delhi, Bihar, North BengalÂ and the border area of India and Nepal, is under this zone. Zone 5 Kashmir, the western and centralÂ Himalayas, North Bihar, the North-East Indian region, theÂ Rann of Kutch and the Andaman & Nicobar IslandsÂ fall in this zone. Exposure: Risk associated with an earthquake prone area increases with the dense population of that area. Causalities are calculated by the number of individuals and the quantity and the value of buildings, infrastructure and other properties exposed to that particular zone. However local planning and zoning activities can aid in contributing to the overall development of that place. Vulnerability: The vulnerability of any sort of seismic hazard is measured by the prevalence of earthquake-resistant structure. Buildings that are built in compliance with the latest seismic building code and standards are evidently more capable of withstanding the earthquake damages. You may take a note of construction year of the building as older constructions, built under lesser effective building codes are not at par with the latest seismic resistant construction standards. To know how to CALCULATE SEISMIC LOAD OR EARTHQUAKE FORCES ON BUILDINGS AND STRUCTURES, check THIS ARTICLE. An earthquake resistant construction is mainly dependant on the reinforcement structure. As concrete alone fails to take the tensile load, thus it is reinforced through steel TMT bars. This makes the building strong enough to withstand a certain degree of external hazards. TopTech TMT Bars undergo several studies to evaluate its performance during an earthquake. Tests are conducted on concrete beam column joints with repeated reverse loading and large deformation, a real life earthquake scenario alike. Higher UTS/YS (Ultimate Tensile Strength/Yield Strength) ratio and percentage determines the seismic property of a TMT steel bar. The basic specifications are specifically known as Bar Bending Schedule (BSS). It includes all the details related to size, shape and dimension of the steel TMT bar. Uniform energy dissipation for each cycle signifies high ductility and superior seismic resistant properties for a good quality TMT Bar, which is essential for minimizing structural damages and human casualties. To know how safe you are from earthquakes, CONTACT US with your location and property details.